from the Tower of Babel? and feel the electric fields of their excitement? are spoken in an unexpected tongue. Honey bees can see in colors in the ultraviolet, so they get more visual information from flower petals than we get. Bees in the hive can tell by the smell what kind of flower another bee has visited. 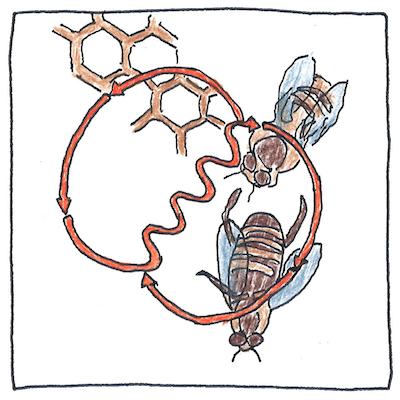 Bees know their directions by the position of the sun, by the polarization of sunlight, and by the earth’s magnetic field. Given directions in a dark hive to a food source relative to the sun, a bee knows the direction even hours later, compensating for the change in the sun’s position.